Reznor’s PCDV units are indirect-fired/makeup air systems designed for either indoor or outdoor installation. Units can be configured for: floor mount, outdoor pad mount, rooftop or suspended installations. A wide range of discharge configurations are possible including: top, bottom or horizontal discharge supply air. 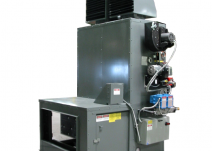 Model PCDV systems are available to operate on either natural gas, propane or fuel oil. Larger sizes are available on special order basis (contact your Reznor Representative for more more information) High cfm version (Model HPCDV) are also available. Model PCDV and HPCDV meet ETL (ANSI) standards for installation in the United States and CGA (CSA) standards for installation in Canada.